Looking over the Golden Gate Bridge and the Pacific Ocean, the Presidio is a must-see sight for groups visiting San Francisco for a wedding, convention, field trip, or other private event. Rent a charter bus or minibus with National Charter Bus San Francisco to effortlessly transport your group to the Presidio and around San Francisco Bay. Whether the Presidio is simply a stop on your journey or the actual destination, National Charter Bus San Francisco can help you find the best bus for your trip. Call our friendly customer service team today at 415-226-7853 to experience our simple, no-obligation bus rental process. The Presidio is a principal landmark of the Golden Gate National Recreation Area. 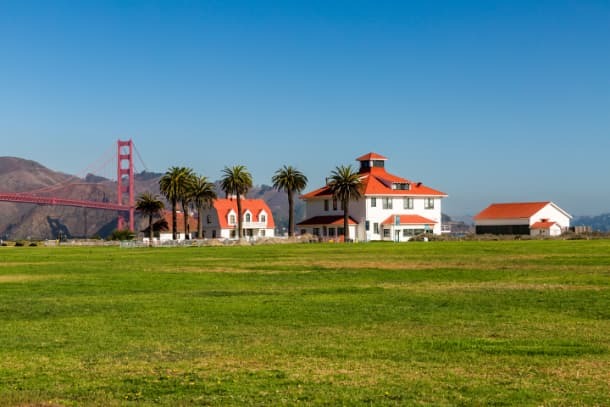 Covering 1,480 acres, it is home to a wide range of restaurants, scenic overlooks, sculptures, beaches, and trails, so no matter what your group is looking to do at this nationally-recognized park, you will find that the Presidio has plenty of entertainment options to fulfill everyone’s interests. 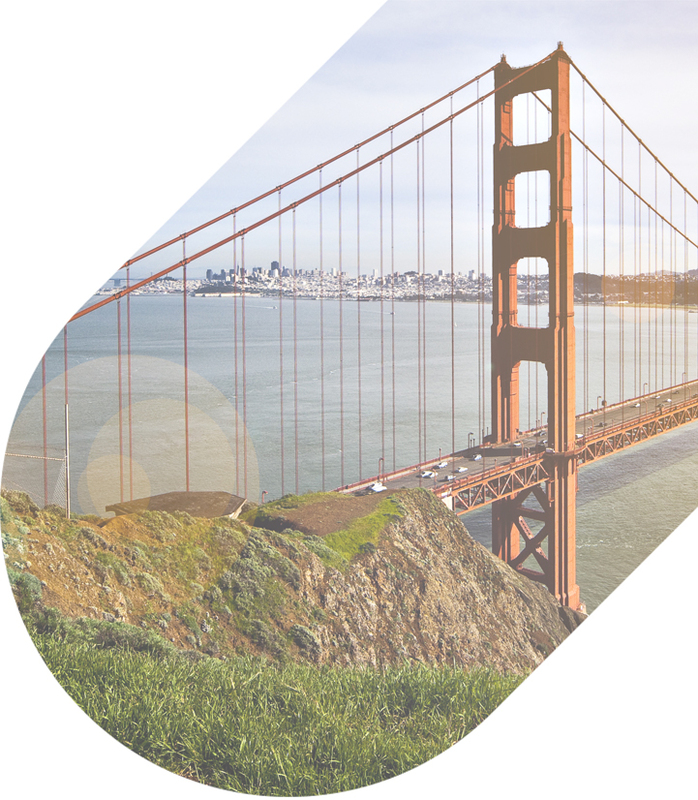 National Charter Bus San Francisco is here to facilitate your bus rental to the Presidio from beginning to end, ensuring that you enjoy your time without stressing about coordinating transportation. If you’re a small group, you might be tempted to rely on rideshare services and even your personal vehicles to travel to the Presidio. San Francisco is famously difficult to navigate, making traveling in cars a non-option for many groups. Don’t stress about scheduling multiple drop-offs and instead rely on a comfortable bus rental from National Charter Bus San Francisco. The Presidio’s website urges visitors to use public transit, bikes, and scooters to visit the park. Though these are fantastic modes of transportation for solo travelers, they are not fitting for a large group looking to stay together during the entirety of the trip. With a charter bus rental from National Charter Bus San Francisco, you’ll take unorganized arrivals out of the equation, streamlining your travel experience, maximizing comfort, and eliminating headaches. Thinking about renting a school bus to save on costs? Depending on your point of departure and your chosen provider, a school bus rental can be equally expensive without offering any of the comforts of a charter bus rental. Invest a little more on your ride to get access to upgraded amenities such as plush seats, ample leg space, overhead storage, climate-controlled interiors, WiFi, and PA systems. If you’re traveling with luggage, handbags, and other carry-on items, you will also have the luxury of leaving them in your private bus without worrying about thieves and other inconveniences. National Charter Bus only works with certified operators who are trained to wait for you according to your schedule. No matter the length of your itinerary or the number of stops on your journey, National Charter Bus will match you with a driver who will be there for you every step of the way. The Presidio has been a military stronghold for various political establishments throughout American history. Initially a fort of New Spain, it briefly became a Mexican stronghold before being seized by the U.S. military at the beginning of the Mexican-American War. 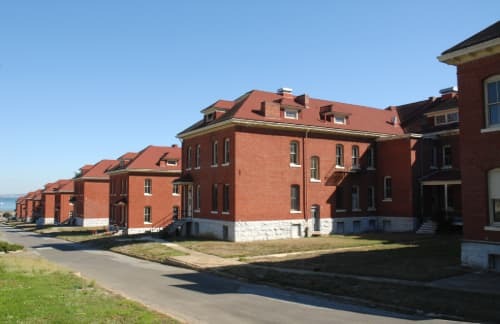 The Presidio has been a central player in most military conflicts in the Pacific region, including the Spanish-American War, the Philippine-American War, and the Second World War. Whether you’re a group looking to nourish your love of history or a teacher planning a field trip to Fort Point, you will find plenty of things to learn at the Presidio. Start at the Presidio Visitor Center, where you will have access to maps of the grounds, interactive exhibits, and event schedules. After the center, head over to the Presidio Officer’s Club, where your group will be able to experience 10,000 years of the Presidio’s history. Artifacts and short films will give you an interactive overview of the park’s role in various conflicts and wars. Other points of interest in the park include the Korean War Memorial, the San Francisco National Cemetery, the Military Intelligence Service Historic Learning Center, and--most notably--the Fort Point National Historic Site. With a bus rented through National Charter Bus, your group will spend less time stressing about transportation, parking, and logistics, and more time learning about the Presidio and its role in American history. Our team of travel professionals are prepared to match you with the best bus for your trip. From 18-passenger minibuses to 56-passenger models, National Charter Bus has access to it all. You no longer have to rent a bus through the slow, antiquated process of traditional bus operators, and best of all, we’re here 24/7 to serve you during your trip. Our safety record is unmatched in the charter bus industry, so whether you’re traveling with a group of little ones and a group of senior adults, you can count on National Charter Bus to keep your group safe even in the most unnavigable of San Francisco’s roads. 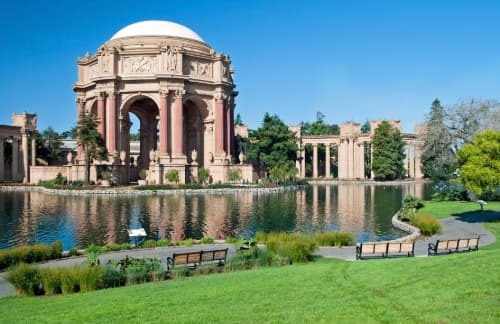 Located right outside the Presidio, the Palace of Fine Arts offers theater performances and event spaces for private engagements. Perfect for a group photograph, the Lyon Street Steps is a fun stop for your group to stand and enjoy the San Francisco scenery. This museum offers a fun array of vintage vehicles and machinery from the San Francisco Fire Department. For the vintage architecture fanatics in your group, the McLaren Lodge is the perfect stop to experience one of San Francisco’s most prominent pieces of Spanish architecture. With a bus from National Charter Bus, you can travel from the Presidio to any attraction in San Francisco without worrying about parking and carrying all your things. A private bus will ensure everyone in your group is comfortable from the beginning of your itinerary to the end. Ready to plan your trip to the Presidio? As one of San Francisco’s most popular attractions, you might have trouble finding transportation, but National Charter Bus is here to help. Even if you’re traveling from Los Angeles, Denver, and even Dallas, we can help you find the most comfortable bus for your long-distance trip. Our reservation process is simple and easy. Call our team 24/7 at 415-226-7853 to get your free quote!